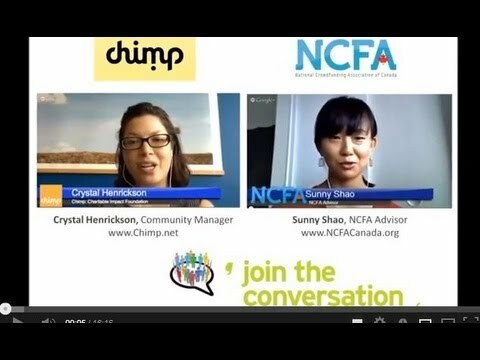 NCFA Advisor Sunny Shao talks to Crystal Henrickson, Community Manager of Chimp, which stands for the Charitable Impact Foundation. Chimp is a website that connects you to all of Canada's registered charities. It's like a charitable bank account, allowing you to manage and amplify your charitable giving while still receiving tax receipts for your donations. Chimp was founded by John Bromley, whose early exposure to the charitable sector comes from his dad, Blake Bromley, who is one of the world's leading charity lawyers. This appreciation, combined with his background in corporate finance, led John to bring strategic, thoughtful charity to the masses by using the internet and new technologies. 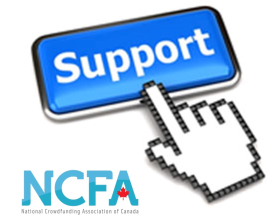 John found that many of the current methods that charities were using were causing "donor fatigue", thus he saw a need to create a fund platform that is fun and cause-neutral by design. Through Chimp and John's other startup Peer Giving Solutions, the team's goal is to help donors participate in charity in easier and more meaningful ways. Chimp is associated with all Canadian registered charities and tries to promote thoughtful generosity, allowing users to browse and search by location and cause, and also shows all relevant information about a charity including revenue, expenses and current programs (based on what the charity has reported to the CRA). "We really want people to have fun on Chimp and we encourage them to learn about the charitable space," says Crystal. "It can be daunting when it comes to giving, since many people know that they want to give, but they don't know what's going to happen with the money, or they are worried about receiving too many promotional materials afterwards. You can give anonymously on Chimp, which alleviates some of the donor fatigue. The best place to start is to think about what has meaning to you first, and then narrow it down by location or cause." With the crowdfunding industry heating up, Crystal is seeing that the way people are going about collectively pooling money together is shifting - the technology is there to help people fund better, such as with giving groups on Chimp. Groups of people are pooling their money together towards a charity by organizing events and fun initiatives around giving. One example of this is a "vice jar" at Chimp headquarters, where employees contribute money to the online pooled fund every time someone succumbs to their vice. This money is collected in one fund first so that it is secure and transparent for the group to see, and released to the charity after the group has decided on one or more charities to give to. Chimp supports individual or group giving as well as corporate giving. Chimp is called a donor-advised fund described as a "giving platform" created to manage charitable donations on behalf of an individual, group or organization. The Charitable Impact (Chimp) Foundation manages the money held in everyone’s Chimp Funds. It’s a registered Canadian charity; that’s why all the tax receipts issued through the website come from this foundation and not the charities that donors give to.